First off, welcome to the new Vinopanion. A massive thank you to HoustonWino (Another Wine Blog) for the clean facelift and major troubleshooting. The second bit of big news is that I am headed back to Spain, woot! The good folks at D.O. 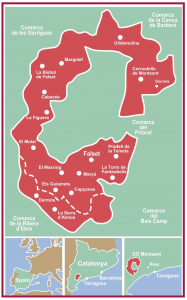 Montsant, a somewhat younger wine appellation centered around the town of Falset, southwest of Barcelona, is bringing a big contingent of wine writers, bloggers and trade for a tour of the DO. The free media trip is compliments of DO Montsant, so our time will be intensively focused on this small, but exciting DO. 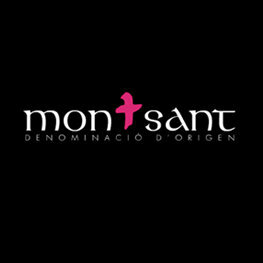 You can follow along with #DrinkMontsant! I have been quite blessed to attend multiple wine media junkets to the incomparable lands of Spain, visiting DO Navarra, then another to the highly DO contained within Murcia (Bullas, Jumilla, Yecla), and most recently, those containing properties owned by MG Wines (Alicante, Bierzo, Bullas). Joining me on this tour of Montsant will be #Vinopanion‘s old and new (and some previous Spanish wine companions): 1WineDude, James the Wine Guy, Just the Bottle, Grape Experiences, Snooth, Another Wine Blog, The Academic Wino, Drink What YOU Like, and Drinkable Grape. In addition, representatives and MW/MS/WSET wine students from the Wine Scholar Guild and the venerable (and local) Napa Valley Wine Academy. Image courtesy of DO Montsant. So, what can we expect from DO Montsant? Well, this little moon-shaped wine region is found facing east towards the Mediterranean, which is about 15-20 miles away. It is contained within autonomous community of Catalunya, noted for its great city of Barcelona to the NW. The DO was founded in 2001 and is comprised of 65 wineries and 16 villages. The Ebro River flows through DO and exerts its influence on the roughly ~4700 acres of vineyards, much of which are planted along hillsides with varying inclinations and elevations up to 2500 feet. The climate tends to be warm to hot Mediterranean, but the river, the sea and the mountains all combine to also cool the vineyards down in the later afternoons and at night, maintaining good acidity. Six white grapes are allowed in the DO, with garnacha blanca and macabeu dominating those blends. Meanwhile, the reds can be any from 10 varieties, and garnacha tinta and cariñena are the predominate varieties. We will be staying in the largest village in the region with a whopping 2,900 population (similar to my hometown of Yountville :-), Falset. That’s all fine and dandy and can be gleaned from any international wine tome, however. I want to find out why this region worked so hard to ratify their own DO…do they still feel connected to the winemaking history of the region that dates back to the Romans? What goes into their bush-trained old vines and how do they tackle sincere craftsmanship in their wines, while still trying to export to international markets? Who are the men and women that are behind these wines, who are the families that have made their mark in this region? What drives them, day to day, to continue to improve their wines, while still maintaining their traditional, Montsant identity? These are the questions I want to answer during this incredible trip. Follow along by searching #DrinkMontsant! ¡Salud a todos! This trip is a fully paid media trip, courtesy of DO Montsant. Very cool! Montsant wines were a stand out on a trip several years ago, it’s great they’re being elevated.